My parents worked arts and craft shows while I was growing up. Although they made and sold wooden candle lanterns, my heart was elsewhere~~I poured over the booths of natural stones, hand made jewelry, and frequented the lapidary's station. I love the natural formations of rocks and minerals, especially how agate looks after being polished. All the natural imperfections and striations in the stone were mesmerizing to me. When I found these burnt orangish crab agate stones I knew I had to make something. I mixed in some freshwater pearls, white with the faintest tinge of pink, added antiqued pink Swarovski crystals, antiqued copper bead caps and finished with a copper toggle clasp. Perfection. I have two bracelets~~each bead has its own personality~~a product of years of compression under the earth, the gem smith's turn of the wheel as it was being faceted, and coloration. Bracelet as shown measures 8.5" in total length but with a smaller inner diameter. I typically wear a 7 inch bracelet and this measures a bit loose on my wrist. I can definitely add extra length to the toggle if you need it larger. I didn't include a separate picture of the earrings, but you can see them in the background. Earrings are the same pearls, Swarovski crystals and bead caps. They hang from 1.5" copper kidney wires. Add on for a complete set. Click here to see/buy on Etsy. Coordinating earrings include the same pink coin pearls and Czech glass. Here they fall from antiqued copper french hooks, but you could select leverback wires, too. Necklace measures 32 inches and is finished with an antiqued copper lobster clasp. I liked the silver and blue dragonfly set I made earlier in the month so I had to make something similar in vintage brass. Dragonfly measures 1.75" wide and 1.5" tall. I designed this necklace to wear as a full 18 inches. Chain is antiqued soldered link brass and will wear well! Clasp is also brass. I finished the necklace with more of the same apatite chips and white pearls next to the clasp for a decidedly feminine finish. I created dainty earrings with the same apatite stones and pearls hung from a vintage bronze floral connector and antiqued gold plated brass leverback wires. Earrings measure 1 3/4 inch from the leverback wires. If you'd like different earwires at checkout please specify. To see/buy on Etsy click here. Turquoise is truly a rock of ages...it's used in jewelry from times going back as far as the ancient Egyptians. Rock of Ages is a classic composed of three strands of genuine Arizona turquoise finished with sterling silver. 19.5 inches long. Click here to see/buy on Etsy. There's only 1. At the request of a friend, a 20 inch Indigo blue necklace wire wrapped with antiqued silver wire in Czech Glass and Biwa Coin Pearls. I threw in a few crystal shade Swarovski bicones and finished with a stainless steel clasp. Drop earrings are suspended on 2 inch stainless steel kidney wires. Make a statement in this snazzy little number. Strawberry Ice makes me want a scoop of pink strawberry ice cream in a clear glass tumbler. I made this necklace in antiqued silver and finished with a stainless steel lobster clap. Pink turquoise magnesite beads are 20mm in diameter. Should fit quite nicely inside a shirt collar. Necklace measures 16.5 inches in length. Coordinating earrings fall 1.75 inches and have Swarovski crystal gracing the pink gemstones. Necklace $33; Earrings $13 See on Etsy here. I fell in love with this shade of lime green this year. I mix it with pure white, turquoise, and for a loud entrance, hot pink. These are faceted lime magnesite teardrops which I messy wire wrapped in non-tarnishing silver wire. Here, they are depicted hanging from silver plated leverback ear wires, which wear well. I've given you additional choices above if you'd prefer another style. Click here to see on Etsy. Can you tell we've made a number of these darling Enchantment necklaces? It's a Magpie best seller~~who can resist the greenish blue crystoprase, freshwater white pearls, antiqued silver spacers, swarovski crystals, all with a pewter butterfly pendant. Enchantment measures 16 inches long and finished with a mermaid toggle claps. Necklace is $34, Earrings $ 13 Click here at to see/buy on Etsy. Wear your faith proudly! This is an awesome brass dogtag declaring faith and allegiance. It is accented with a wire wrapped genuine citrine 10mm bead and finished by the clasp with fire polished czech glass beads for a delicate touch. I also wired in another bead a few inches into the chain above the pendant. The pendant on this necklace falls two inches from the chain. Chain as shown is 31 inches in length. Choose your preferred length at checkout. All Magpies are made by me in my home studio. All metals used are nickel and lead free. The chain used in this necklace is soldered link antiqued brass chain which will wear well. This Citrine gemstone is much paler shade than the typical bright yellow. I think it captures sunlight with radiant rays. Click here to buy on Etsy. Tangerine Sunset makes a bold statement of fun, beach and color. Tangerine is one of the 2015 Pantone colors of the year. I can see it worn with so many ensembles. I created small earrings with a matching shade of turquoise to balance the boldness of the necklace. I do have a matching turquoise in 12mm round beads for a much larger style. Composed of bright tangerine orange magnesite, Swarovski crystals, and a bold turquoise pendant, Tangerine has been finished in 4mm orange magnesite beads for a smooth finish. The necklace is finished in sterling silver filled chain and with a sterling silver lobster clasp and crimps. It measures 19-21 inches. Delightful Neo Victorian vintage style brass earrings for all the Februarys out there. I added layers of filigree bead caps and a Swarovski crystal for a touch of bling. When you hold the earrings to the light you see translucent glimmers. From the leverback wires, earrings measure 1.5". Earring beads are faceted fire polished Czech glass. Wire is brass. Choose your earwire preference (all brass) at checkout. I have french hooks, 1.5" kidney wires and leverbacks, all in antiqued brass. Click here to buy on Etsy. I have several pairs. I've had these dragonflies pinned to my inspiration board for quite some time. Finally, inspiration struck! I laid them out on my design boards with these soft blue Biwa pearls, added a few Swarovski crystals and voila, she flew. I designed this necklace to wear as a full 20 inches. Chain is antiqued silver plated brass and will wear well! Clasp is stainless steel. I finished the necklace with tiny blue Swarovski pearls next to the clasp for a decidedly feminine finish. Click here to see more images on Etsy. I created dainty earrings with the same antiqued silver chain, Swarovski crystals and pearls and hand antiqued silver leverback wires. Like chunkier earrings as I do? Click here to see a pair that will match as well. These are the cutest, daintiest earrings ever. These are petite and adorable~~perfect for that dainty feminine feeling. Earring beads are freshwater pearls and transparent lucite tulips. I added in Swarovski crystal and antiqued copper bead caps. I wired the earrings in antique copper artisan wire and hung them from copper leverback wires. Earrings hang right under 1.5" with leverback wires. This lampwork glass is amazing. On a black base the artist wove in light minty green, shades of blue, brown and touches of brown. I added layers of vintage brass filigree bead caps and a Swarovski crystal, all for a Neo Victorian feel. Earrings show leverback earwires, but choose your favorite style at checkout. Earring beads are lampwork glass. Each pair has slightly different markings. They measure right under an inch in diameter and fall 1.75" from the leverback wires. Wire is brass. Choose your earwire preference (all brass) at checkout. I have french hooks, 1.5" kidney wires and leverback, all in antiqued brass. Click here to buy now from Etsy. The necklace as shown measures 18 inches long to the pendant then 1.25 inches more. Or select a shorter style and I can adjust. For Earrings, gorgeous vintage bronze colored (antiqued gold) filigree cones grace golden brown shell pearls then are capped by Swarovski crystals and hung from antiqued brass finished leverback hooks. Earrings measure 1.5 inches from the top of the leverback wires. Click here to see on Etsy. Necklace as shown measures 16.5" which is perfect for my small to medium sized frame. I wanted the pearl/focal piece to fall below my collarbone. Feel free to request an alternate length at checkout. Chain is soldered link antiqued silver plated brass and will wear well. Clasp is stainless steel. Tiny white pearls are Swarovski. This particular shade of turquoise is called Sleeping Beauty. Maybe it's for the movie colors? Regardless, I find it mesmerizing. These are an amazing blue. Genuine turquoise stones color enhanced for a deeper Sleeping Beauty blue. I get comments everywhere I go when I wear these. I messy wire wrapped in sterling silver filled wire and hung them from artisan style sterling silver earwires. This is a pair you won't want to loan out. 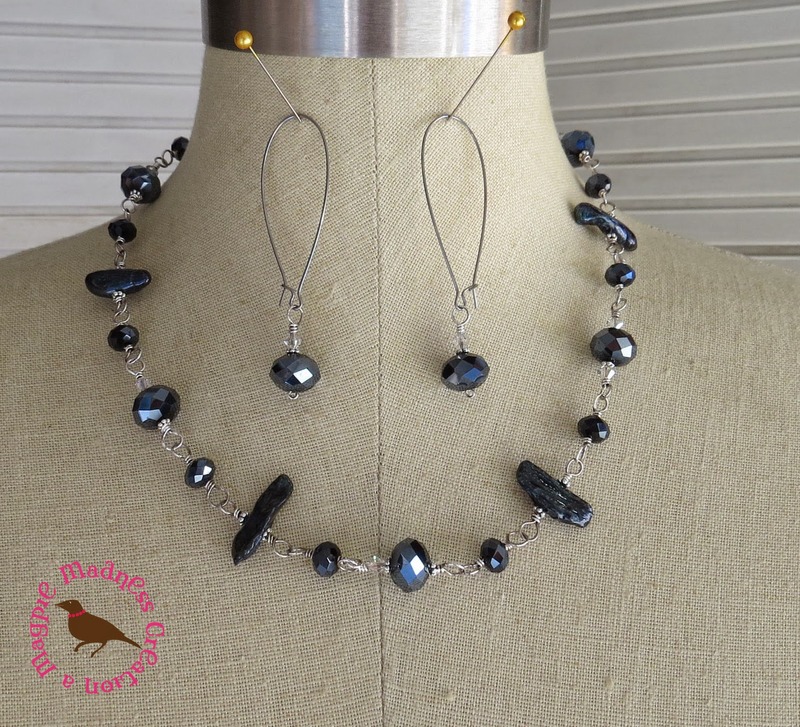 Each pair of teardrops has slight natural stone variations but will look very similar to the set I have pictured here. To buy on Etsy click here.